The Pleasant Point Health Center was established by Tribal Government to provide direct health care services to its service population of eligible members. Care is given to all members of Federally Recognized American Indians/Alaska Natives as well as others in accordance with regulations set forth by the Indian Health Services. With funding provided by the Indian Health Services and collections from third party payers, patients are able to access a broad scope of health care services without having to travel great distances. On-site/direct care services include but are not limited to; pharmacy, general medicine, endocrinology, diabetes care, well-child examinations, internal medicine, behavioral health, psychiatry, general dentistry, nursing and laboratory services, WIC and Nutrition programs as well as specialty clinics for men's and women's health, optometry, pulmonary care, podiatry, and chiropractic medicine. In addition to the comprehensive range of services provided at the ambulatory care clinic, the Pleasant Point Health Center assists eligible members who require assistance in obtaining referrals for contracted health care services from off-site providers and local hospitals. The mission of the Pleasant Point Health Center is to provide the highest quality of health care available to the community we serve. We are funded through a contract with the Federal Indian Health Services. The Pleasant Point Health Center operates as a local comprehensive Health Care Delivery System under the "P.L. 638, Indian Self Determination Act." Our primary contracting office is located in Nashville, Tennessee. Alternate Resources, such as payment from Medicaid, Medicare, Veterans' Benefits, and Private insurance, provide additional funding to provide essential services to our community. We rely heavily on income from third party payers, as the level of funding that we receive from Indian Health Services is limited. 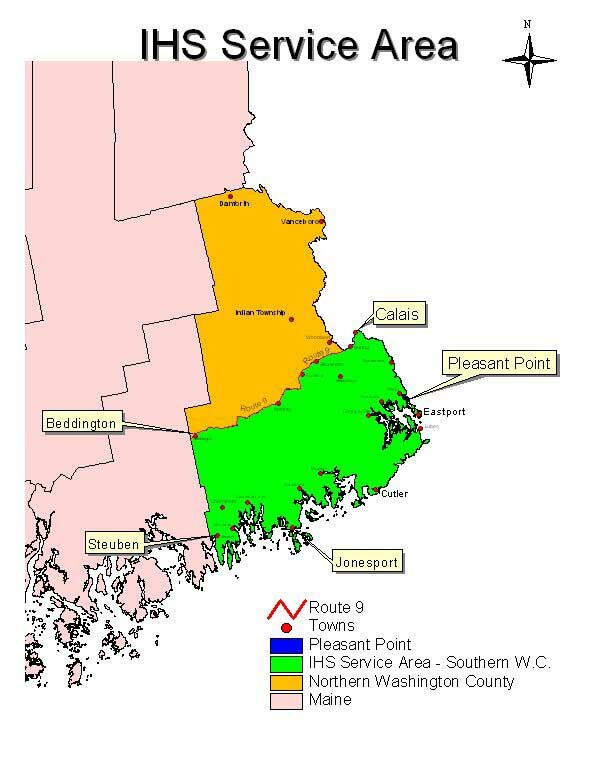 The Contract Health Service Delivery Area (CHSDA) is defined as all of the area in Washington County, Maine described as: South of Route Nine (9) from Milbridge in the Southwest section to Calais in the Northeast section. See Service Area Map Eligibility Criteria for Passamaquoddy Tribal Members is determined by the Congress of the United States and published in the Federal Register. It is our hope that the information contained in the following pages is helpful to you. It has been assembled to assist you in accessing services available at the Pleasant Point Health Center. We may not be able to answer all of your questions, but we hope that this information has been helpful to you in learning about your health clinic and the types of services that we can offer to you, the patient. We look forward to continuing to provide a wide range of services designed to help Passamaquoddy People live longer and stronger. If you have any questions, or would like to discuss any aspect of health care delivery, feel free to call us at (207) 853-0644. The Pleasant Point Health Center is pleased to have 24-hour Emergency Medical Services as part of their team. For all of your emergency services, please call the Sipayik Ambulance at (207) 853-2551 or 4811. In addition to regular services, the Sipayik Ambulance also has paramedic coverage on weekends. Please note that the Pleasant Point Health Center is not able to pay for transportation by any service other than the Sipayik Ambulance. If the Sipayik Ambulance is unavailable, they will dispatch another service for you, which will be paid by the Pleasant Point Health Center. If you have an emergency during non-working hours, be sure to call the Receptionist at the Pleasant Point Health Center within 72-hours to notify. Failure to make notification within 72-hours will result in non-payment of any bill associated with the emergency.